One of the principles of proper AD administration is to congregate your users into groups to make it easier to assign permissions and rights. We use groups within Intune as well for this same reason. In this case, Intune uses Azure AD to manage access to your company’s resources which is controlled using roles in the directory. There are two default groups within every implementation of Intune. If you are using Intune for Education and you use School Data Sync to import you school records, you have two additional default groups. These default groups represent a very broad scope and by themselves probably aren’t of much use. That is why we need to create custom groups that can be tailored to the needs of our organization. 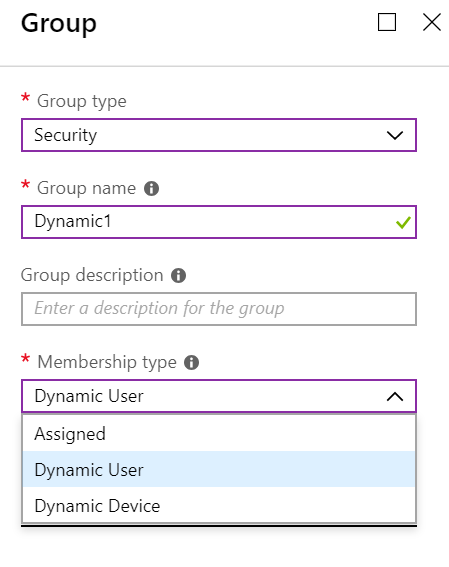 There are two types of custom created groups in Intune, one being Assigned Groups. Assigned groups are used when you want to manually add specific users or devices to a group. You can create groups by a number of criteria such as geographic location, department, hardware characteristics, etc. For instance, you could create one assigned group for your Windows 10 devices and one for your iPads. You could create one for your desktop PCs and one for your mobile devices. You can separate users into separate groups as well such as HR, Finance and Marketing. You can then use those groups to assign policies to users or deploy apps to a set of devices. Note that the ability to create custom groups is available in any MDM service, not just Intune. Creating a group is easy. 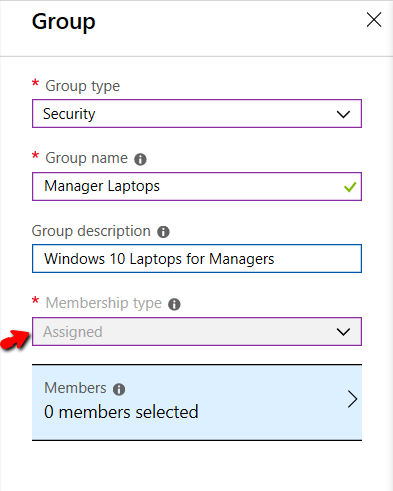 Go to the Groups section of Intune and click “New Group.” Then add the required information for that group. In this case we would select “Assigned” as the membership type. Once the group is made, you can then assign users to that group. Note that just as in domain joined AD, you can nest groups within one another. These subgroups can be used to break down large groups into smaller more manageable sizes. Groups have a hierarchical structure to them in Intune which allows for inheritance. Parent groups are at the top of the hierarchy and any settings applied to these parent groups are passed down to the subgroups. This settings inheritance feature makes it easer to apply settings to large numbers of users and devices. Know that you can only create subgroups under assigned groups. So Assigned Groups are great and there are many uses for them. But we live in a dynamic world today and our Azure/Intune environments are often reflective of that. Things change, and sometimes we need our groups to adapt to those changes. That is why we also have Dynamic Groups. Rather than specifying the users or devices to add to a group, we set criteria to define the members of a Dynamic Group. When the specified condition applies for a user or device, it is added to the group automatically. Should a member no longer satisfy the rule, it is removed from the group. The use of Dynamic Groups can greatly reduce the administrative overhead of constantly adding and removing users for large enterprise environments that perpetually change. There are a couple of things that are different when creating Dynamic Groups. First off, P1 or P2 licensing is required to create and use Dynamic groups. Second of all, we must make separate groups for users and devices as is shown below. Once we create our Dynamic Group, we need to populate it. Remember, we don’t select the users or devices ourselves. We cannot manually add or remove a member from a Dynamic group. 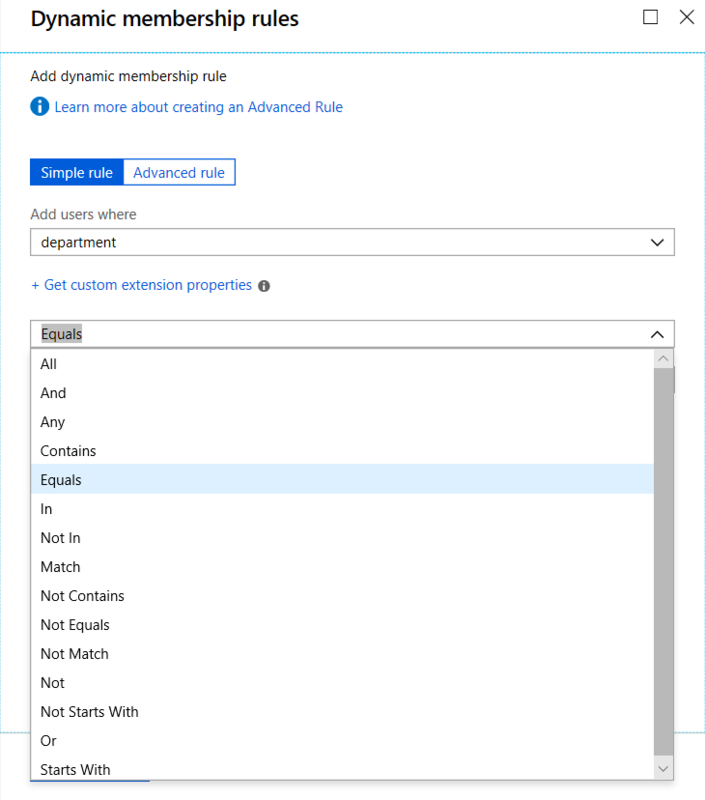 We create membership rules which will then populate the groups by querying Azure AD to find the members that meet the criteria of that rule. Make note again that we cannot create a rule that contains both users and devices. There are two types of rules, Simple and Advanced. I assume everyone wants to start with the easier one first so let’s create a Simple Rule. Say we wanted to create a dynamic group to include all current users of the HR Department. In this case the property would be “department,” the operator would be “equals,” and the value would be HR. If this isn’t sounding very simple, think again, because the Simple Rule creator interface does a great job of guiding you through the process. You just simply choose which option you want from each component menu. This of course means that your rules are limited to the choices made available in the GUI. What is the Policy CSP and why is it special to Intune? So we said that CSPs are embedded interfaces in the Windows 10 OS that give MDMs the ability to read, set, modify and delete configuration settings. This gives administrators the ability to command and deliver settings for enterprise devices. There are many CSPs, but there is one particular one that is special. That one is the Policy CSP. 0 - Disabled. EndTask functionality is blocked in TaskManager. 1 - Enabled (default). Users can perform EndTask in TaskManager. The TaskManager Policy is supported in the following Windows 10 Editions. The Policy configuration service provider contains sub-categories. Policy/Config/AreaName – Handles the policy configuration request from the server. Policy/Result/AreaName – Provides a read-only path to policies enforced on the device. ./User/Vendor/MSFT/Policy/Config/AreaName/PolicyName to configure the policy. ./User/Vendor/MSFT/Policy/Result/AreaName/PolicyName to get the result. ./Device/Vendor/MSFT/Policy/Config/AreaName/PolicyName to configure the policy. ./Device/Vendor/MSFT/Policy/Result/AreaName/PolicyName to get the result. This is a quick introduction to the PolicyCSP. In other blog articles we'll examine more how to take advantage of it. What is a CSP and what is a Custom OMA-URI? (and how do I deploy one in Intune)? CSP stands for Configuration Service Provider. You might think Intune i somehow a CSP but that would be incorrect. Intune is an MDM service. A CSP is a component of the Windows 10 operating system; kind of like a Client Side Extension (CSE) is to Group Policy. The CSP is what gives IT personnel the ability to apply device-specific settings to Windows devices. In our case, that means using Intune to do it. In doing so, IT can be assured that all company devices are compliant with the standards and policies set forth by the organization. Keep in mind that you can deliver setting configurations to CSPs through other means than an MDM such as Windows Configuration Designer, which is used to create provisioning packages. So what are these CSP’s? Well, you can go to Microsoft’s website and look them up at https://docs.microsoft.com/en-us/windows/client-management/mdm/configuration-service-provider-reference. Notice that not all operating system editions support each CSP because some settings are unique to select OS versions. In addition, many CSP’s contain settings introduced in designated Windows versions. This means that the settings are not supported in versions prior to that release. CSP settings accept some sort of data type value to enable or disable the setting. In this case, the data types are integers, either a 0 or a 1. A value of 0 disables the settings while a value of 1 enables it. The setting RequireDeviceEncryption for instance allows an administrator to require the use of BitLocker encryption on designated devices. So let’s say our security minded administrator wants to deliver an integer data value of “1” to the BitLocker CSP contained within the HR and Finance devices. That administrator just needs an interface to configure, assign and deliver them, and that is where Intune comes in. 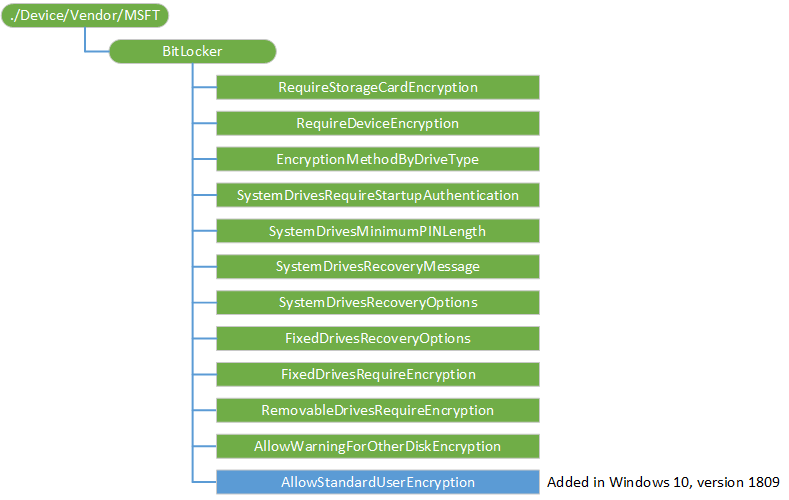 Below, a Profile was created called “BitLocker Settings” that now delivers the selected Windows Encryption settings. How easy was that? Ridiculously simple indeed. Keep in mind that not all CSP settings are "surfaced" as settings within Intune. So what happens when we want to configure settings on a CSP that doesn’t appear in Intune? Well, there are two options. The first would be to sit and wait around with our fingers crossed and hope that Microsoft Intune developers will add our desired settings soon. The other way is to take matters into our own hands and make a Custom OMA-URL. So how do we do this? A key (and useful) example is how to make MDM vs. GP more deterministic. Starting with 1803 however, a policy called “ControlPolicyConflict/MDMWinsOverGP” was created to give you control over which one won. So while the policy setting doesn’t appear by default, we can create a customized URI for it that will enforce the outcome we want. 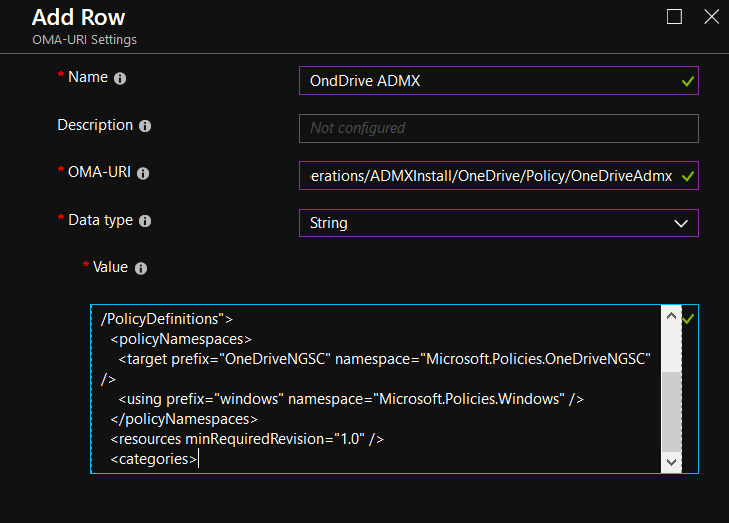 Intune provides an interface to create Custom OMA-URI policies within a profile. We just have to provide some information which is outlined below. But the point is: Don't have a "knob" for the setting? Make a custom OMA-URA and you're off to the races. What is Azure AD connect, and how is it related to Intune? If you are familiar with the concept of Windows Server Active Directory, then you already have a good idea of what Azure AD is. It essentially is a cloud version of Active Directory which was introduced in Server 2000, which seems like forever ago. In technical terms, it is Microsoft’s cloud-based identity and access management service. The basic concept of the two AD’s is the same; users logon and authenticated to AD and then access resources. So why the need for Azure AD? Well, we live in a different world today than we did when Server 2000 was unveiled. We live in a mobile age that is dominated by the Internet and traditional AD wasn’t designed for a world like that. Azure AD on the other hand is designed to support web-based services that use Representational State Transfer API interfaces. In simple terms, it was created for cloud based applications such as Office 365, Salesforce.com, etc. To do that, it had to be based on completely different protocols, specifically SAML and OAuth 2.0. The differences between these different versions is two fold. As you move up from the free version, you get more features, which of course, you guessed it, costs more money. 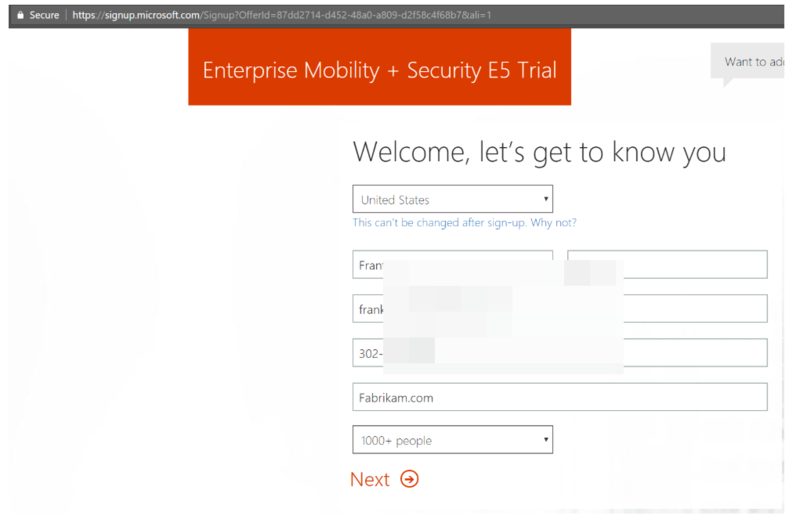 Except for Azure Active Directory Free, which is complimentary if you have a paid subscription to Office 365, Microsoft Dynamics CRM Online, Enterprise Mobility Suite, or other Microsoft services, the other versions require some sort of subscription free that goes up along with the number of feature packages. Azure AD Directory – the equivalent to the domain of Windows Server AD, it is what contains the tenant’s users, groups, apps, devices, etc. Azure AD Account – an identity created through Azure AD or another Microsoft cloud service such as Office 365. The Azure AD account gives users access to their organization’s cloud service subscriptions. 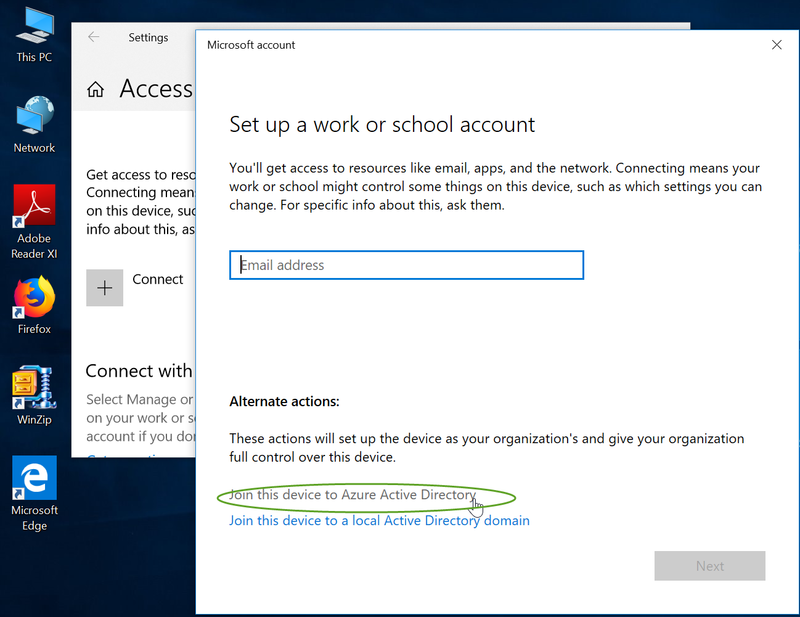 On a Windows 10 device, it is referred to as a Work or School Account. The screenshot below illustrates how one would manually join a Windows 10 device to Azure AD. Azure AD is highly scalable. Even the free version can contain 500,000 objects. With so many users, accounts and applications, an organization undoubtedly needs one or more administrators to manage everything. Below is the management screen of Azure AD. So how does Azure AD relate to Intune? Well, the two work hand-in-hand. In practivcal terms, you really cannot have Intune with Azure AD. 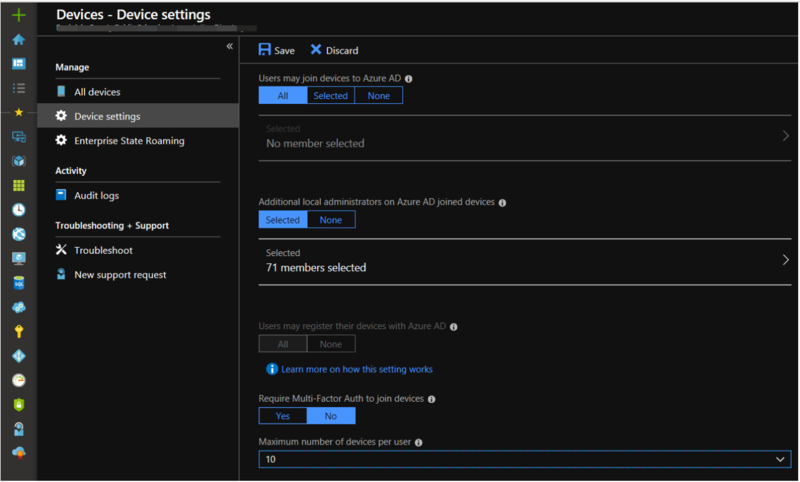 In the same way that Windows Group Policy helped deliver and manage settings for Windows domain join machines, Intune is the mobile device management tool that integrates with Azure AD in order to manage settings as well. It also protects your organization’s resources by controlling how users can access and share it and can lock down devices that may have been stolen or compromised. Another article.. Not mine.. from Microsoft. Good one. I do talk about this in super detail in my GPbook.. in the Troubleshooting chapter with more details; but this is an excellent first start. And give you some tips and tricks for analyzing the data and making conclusions. Hope this helps you out ! There are a number of things that are complicated and hard to comprehend at first. College algebra, quantum physics and Microsoft pricing when it comes to their cloud services. 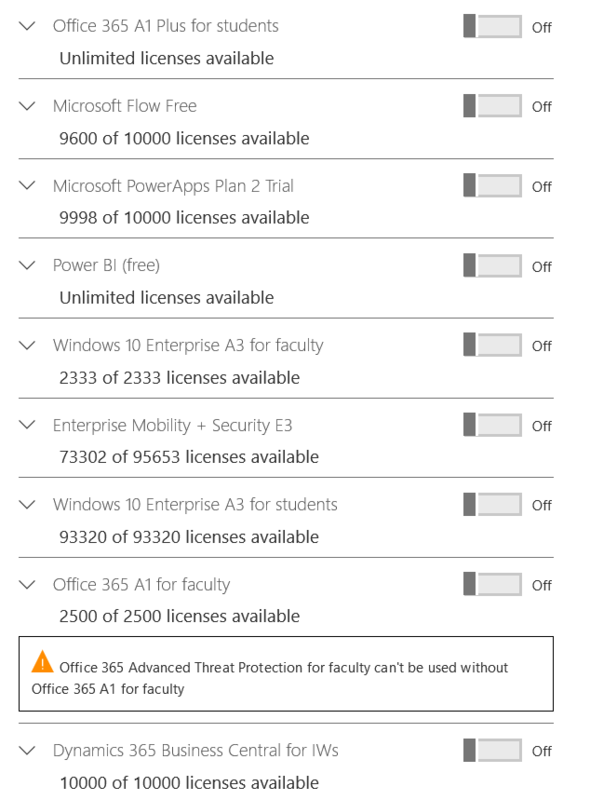 For instance, here is a screenshot of just some of the available licensing for a school system that currently utilizes Microsoft cloud services. At first glance, trying to wrap your head around all of the available licensing options can be as exhaustive as contemplating the size of the universe. There are so many ways to slice and dice subscription licensing when it comes to Office 365, Intune, Azure, etc. For the sake of this blog series, we are going to make it simple. So what is P1 and P2? Well P2 includes more advanced features and capabilities. For instance, the P1 bundle for Azure Active Directory gives you the ability to secure single sign-on to cloud and on premise apps. It also offers multifactor authentication (MFA) conditional access and advanced security reporting. P2 includes all of that plus offers Identity Protection and Privileged Identity Management (PIM) and advanced capability concerning identity protection. E5 of course is more expensive. So should you get E3 or E5? Well, just like buying a car, this isn’t a decision that a business should make without a little time and consideration concerning what the needs of the organization actually are, as well as their budget. Your decision also depends on what other Microsoft cloud services you subscribe to as well such as Office 365. I told you it was complicated. If you want to test drive all of the features that E5 has to offer, the good news is that you can sign up for an E5 trial. That part I can truly say, is easy.